I haven’t been as active on Carsonpedia as I had hoped. I’ve only written a few articles there since I launched the site on the First. Of course, I completely expected that this would happen, since I am a confirmed procrastinator, but I had hoped to be able to prove myself wrong. I also made a page about the Great Fire of 1875 (so I was on a Virginia City kick), and actually had other contributors create pages about the Laxalt Building, U.S. Mint, and Blasdel Building. So, it’s not like the site is dead. It’s just growing slowly. Something I started today is wildly ambitious, which probably means it won’t be completed for five years, if ever. 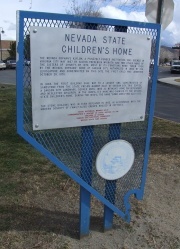 But I started a page for the Nevada State Historical Markers. You know, those little blue signs you see all over town. There are 266 of them in the state, and I want to get pages for all of them up on the site, with pictures of the sign and the full text. It’s an idea I’ve been kicking around for a couple of years, originally planned as a section on Around Carson. But ideas like this are perfectly suited for Carsonpedia, so I’ve shifted it over there. Posting the text is the easy part; the State Historic Preservation Office already has a website which lists the full text of every marker out there, so it’s a matter of copy and paste. But the photos will be more interesting. A lot of the markers are right here in town, so it would be easy in a couple of hours to jump around town and knock them all out in one day. But some of them are quite remote, on the many backroads of the Nevada desert. Getting those would be quite a project. And that’s where the collaborative nature of something like Carsonpedia comes into play. Between all of us reading this, we make up an army of photographers that could descend on the desert to photograph these signs. And it would still be a big effort, but each of us would only have to play a small part. I know it’s a tiny insignificant little thing, cataloging all the historical markers. But it’s the little things like this that people stumble across in their surfing, and it makes them happy, if only for a little bit. Or it teaches them something. Or it lets them travel someplace they could never travel on their own. Every day when I go to bed, I try to ask myself, “How did you make the internet better today?” And with something like Carsonpedia, I feel like I’m doing it, little by little. Even if I’m procrastinating.